So my gobies are available to collect now. Apparently they look healthy and active and their stomachs are "normal sized". I've even had reports that the gobies actually scavenge these algae flakes that the LFS workers put into the tank; who'd have thought they actually eat flake food already! I guess they must have been hungry from the journey (they've had them for 6 days already). I asked about the males appearance and they said that it was black and red. The dorsal fin is also apparently checkered red. I thought they were stiphodon sp " rainbow" but the LFS workers said that the fins don't have the same colour pattern as these gobies, however the face looks similar (as in the blue pattern on it). Odyssey can you have a guess as to what the goby is? 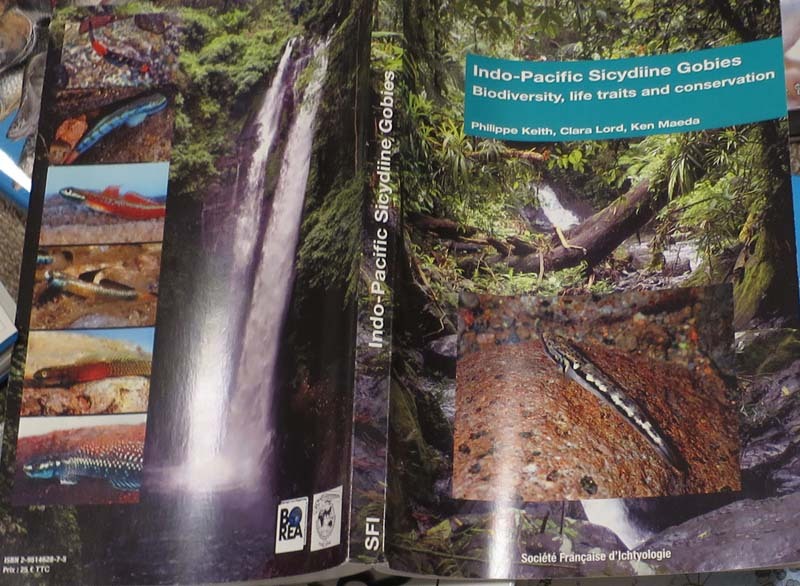 Re: Awful book "Indo-Pacific Sicydiine Gobies"
An awesome book was published! Fortunately I have already obtained it. 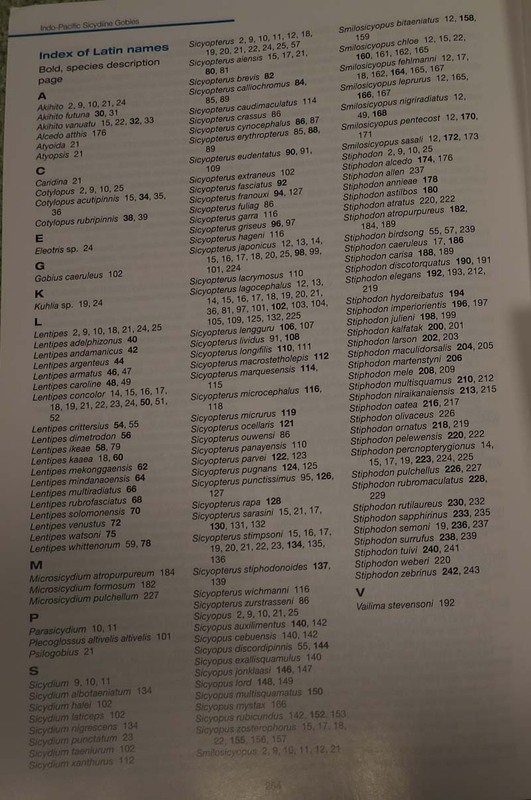 It doesn't seem possible to find the book by the internet search yet. I hope that many people become able to obtain it in the near future. I introduce only the cover page of the book and a small part of the contents here. 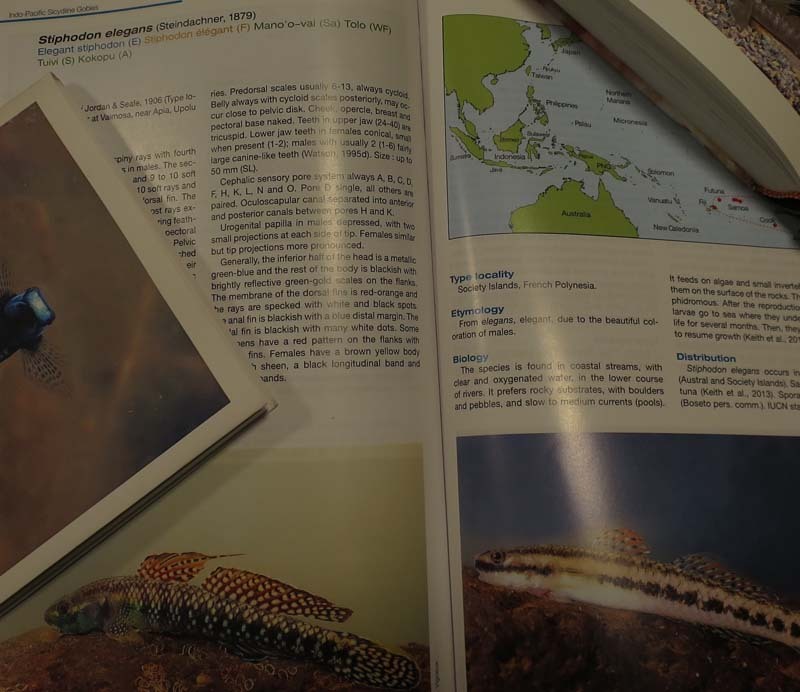 This book includes detailed explanation and photograph of Sicydiine Gobies of the following species. I too , I have received the book, it's a gift from Professor Keith and of his team. Looks like you can email them to order it, wonder if I can get them to ship it to the US for me. I will give it a shot in another month, when I have more capital to expend. There was new species of announcement of the Stiphodon genus today. The scientific article is this. Nice talk to u my name is Karim Li from China Beijing, and I have been learn Goby 5 years, and we also have a goby discussion group of Chinese already have more than 500 members, I really glad can talk to u this time, and I have visited Indo to find goby I hope can become ur friend in future and learn more and more from u, attechment is some picture of mine. Hi Odyssey I really want put our picture on this space,but I have tried long time still not work, feel headace, I also plan go to Halmahera Island on May do u have any good suggestion? do u think we will find Stiphodon percnopterygionus? hi, we also have a group for gobies but for the moment it is the sharing of information concerning the habitats of our gobies that is most important. Karim Li wrote: Hi Odyssey I really want put our picture on this space,but I have tried long time still not work, feel headace, I also plan go to Halmahera Island on May do u have any good suggestion? do u think we will find Stiphodon percnopterygionus? Hi Karim, nice to meet you. Unfortunately, it is only Bali island that I know in Indonesia. 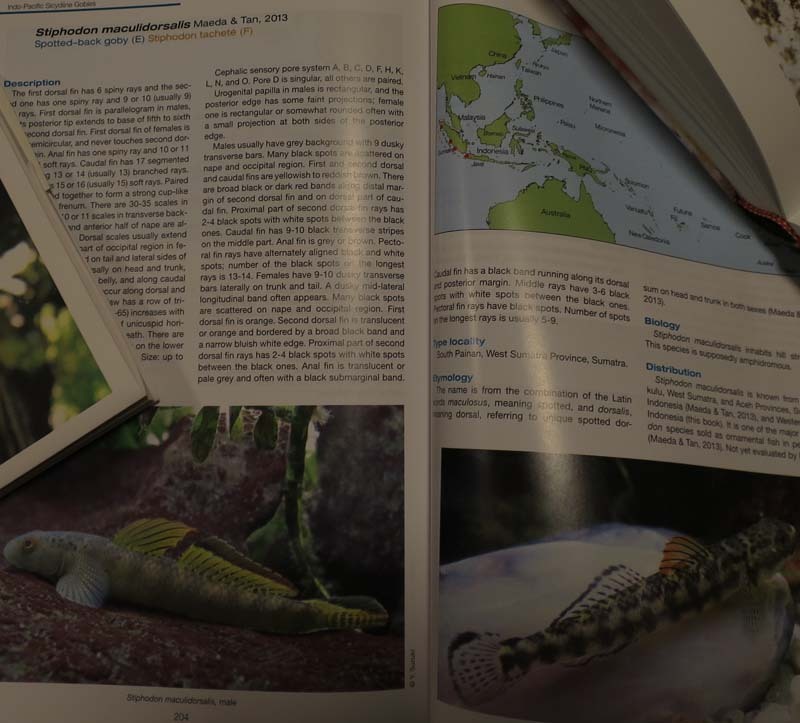 But Swift-Tuttle (a member of LOL) visited Sulawesi island before and shared his splendid photos of goby and other fish. He visited Tomohon in north Sulawesi. Its location is near Halmahera Island where you're planning to visit. His information may be helpful. The habitation area of Stiphodon percnopterygionus is very wide but S.percnopterygionu is not confirmed in Indonesian domains for the moment. The habitat of S.percnopterygionus is distributed over the southern coast of your country. Hi Odyssey how do you keep so many stiphodon together in a quite small tank? fishguy122 wrote: Hi Odyssey how do you keep so many stiphodon together in a quite small tank? I'm applying light to an water tank from 4 directions for 14 hours a day..
A great deal of optical illumination promotes multiplication of an alga. Furthermore I plant many waterweeds. Those leaves are helpful as an algal field and are important as a hideout of Stiphodon. There are more detailed information in the previous thread. My tank has a lot of algae in it (I too leave the light on for 14 hours a day). Would my tank have enough hiding spaces to add a group of 5 stiphodon semoni? I already have 5 s. Ornatus, 1 r. Duospilus and 1 Lentipes sp.? Also, how did you aquascape your tank before putting the plants in? P.s. if I can I'll try and get a better picture later. fishguy122 wrote: Also, how did you aquascape your tank before putting the plants in? I don't care about aquascape. What I mean is how did you place the wood and rocks before planting the tank to create hiding spots? odyssey wrote: What I mean is how did you place the wood and rocks before planting the tank to create hiding spots? I 'm just placing them without doing special consideration. Here is a nicer picture of my tank. I went for a real hillstream look. I did this by placing large rocks at random points and filling in between these with smaller rocks yo create runs. I'm hoping that by having decent hiding spots, a natural look and a fairly high stocking density aggression will be reduced.